I've always loved a good themed party. In my middle school's annual Field Day in which every class was assigned a different color, I cleared my house (and of course, the nearest Claire's) of all signs of said color and found some way to make it all stay on my body (key chain? Not clothing, but I'll take it. Stuffed animal? Perfect, I'll carry it around all day). I plan my Halloween costumes months beforehand and deliberately choose to dress up as something/someone that I can go all out for (last year I bought festival glitter from England on Etsy because I thought it was essential for my unicorn costume....). When "international" came up as a possible theme for a Homecoming party, I asked my friends if the gypsy costume my sister wore for Halloween that year would be too much. I got my answer when they quickly put their Ireland and Africa tee-shirts away and decided against that theme. 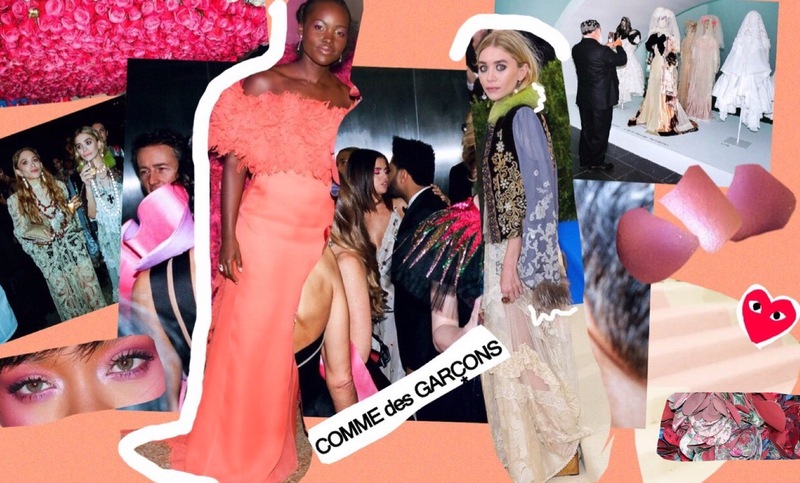 The Met Gala, a.k.a Fashion's Night Out, is known for having a theme every year. It takes place at the Metropolitan Museum of Art and commemorates the annual new fashion installation, which the theme follows. Previous themes have been "Goddess: The Classical Mode" circa 2003, "Anglomania" circa 2006, and "Punk: Chaos to Couture" circa 2013, all overarching costume codes that could very well also be themes for the "galas" us mortals attend, commonly known as "costume parties." When the Met installs an exhibition honoring a particular designer/design house, however, the concept of a themed party gets tricky. Do you show up in a look by said designer? Do you wear a piece that memorializes one of the design house's iconic traits, like tweed for Chanel? Or do you go for a really loose interpretation and craft your look inspired by the designer's personality? I used to not really care if people followed the theme or not. Looking unique and true to you was the prime goal--if you did that and followed the theme, that was the icing on the cake. But that's because the only Met Galas I've payed attention to so far had themes of "China" and "technology." Not a designer, not memorializing a person, but simply an appreciation of an idea or style of dress. 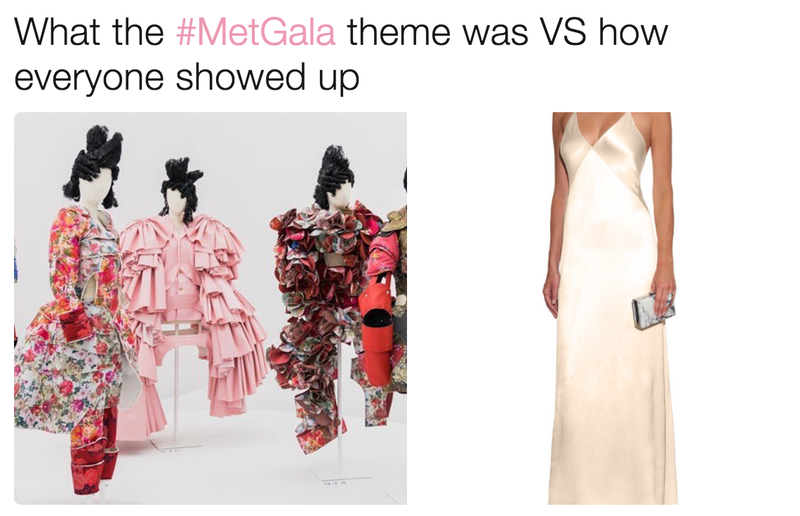 Now, after watching a Met Gala with an actual designer as the theme--Rei Kawakubo and her design house, Comme des Garcons--completely disregarding the theme seems like more of an offense than it had in the past. 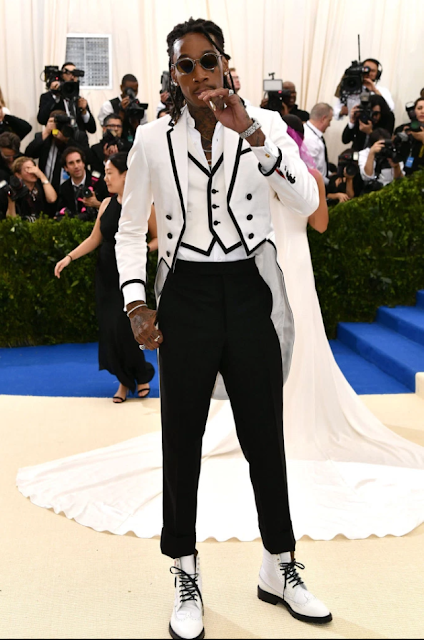 Ok, I get that the Met Gala has become a star-studded event and it definitely is a place for celebrities to establish their style presence/legacy. I'll give them that. And I will admit that some guests seem to be able to give a huge middle finger to the theme and still absolutely kill the Met Gala. So there are some nuances. In the end, it's safe to say that almost everything in fashion is open to interpretation to some extent. It's kind of like the exclusive invitations are begging the question: "What about Comme des Garcons is important to you? What about this brand do you want to amplify and emphasize in order to pay homage?" And with a designer whose overarching ethos is "I'll do whatever I want," it seems like almost anything people wore on May 1 could be technically, in some form, and in some way, following the theme. Soooo, quick cheat-sheet: because this year's theme honored Rei Kawakubo and Comme des Garcons, buzz words related to the brand are "revolutionary," "intellectual," "art," and "head-turning." Comme des Garcons is not a wearable, everyday brand by any means: Kawakubo embodies the most literal meaning of "fashion is art" by designing inhumane silhouettes that can only be described as sculpture. Many outsiders look upon her collections with confusion, but Kawakubo keeps the enigmatic air tied to her brand by never offering any explanations outside of the title of each collection. She also normalized black as the universal color of fashion and pioneered the pop-up shop--where u at Kylie? This man is the king of men's fashion. These two, for me, are a prime example of the powerful people that can somehow get off scott free when they literally ignore the theme every year. They walk in like they own the place in a way that doesn't necessarily feel disrespectful, so in my mind they'll never fail, but this green-collar jacket is truly the "preservation of winter but commemoration of spring" piece I never knew I needed. Balenciaga's last collection disenchanted me with the brand a little bit. I LOVED the sporty, silky elegance of their SS '16 collection, but then when I saw the SS '17 collection I was like...where did this come from?? What happened??? I wasn't a huge fan of the thigh high boots and seemingly strange color palettes, but Lily turned my notion of Balenciaga on its head. To me, this look is a perfect nod to the weirdness and unpredictability of Comme while keeping Lily's identity intact. Alright, I can't tell if this is on theme or not. Argument for being on theme: it throws a bit of a structural curveball, just like Comme des Garcons does in much higher volume. Argument for not being on theme: she could've worn this to any Met Ball. Regardless, I'm in love with it--while watching E News' live red carpet coverage of the event, I saw what appeared to be a sparkling orange tulle dress in the background of Rihanna's shot and I was practically screaming at the TV to "Show her!! Show her!!!" I think my reaction to this dress is spurred by my current love affair with the color orange (summer, I'm coming for you), feathers (which is why I have a soft spot for Prada and Miu Miu right now), and Myrtle Wilson's "Look at me! I'm a socialite!" 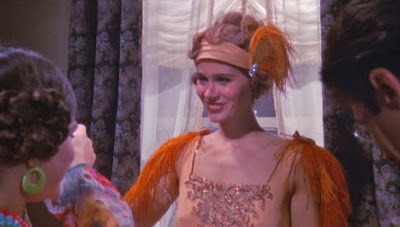 look from the 1974 movie of The Great Gatsby. Lupita literally put that all together in one Prada dress. 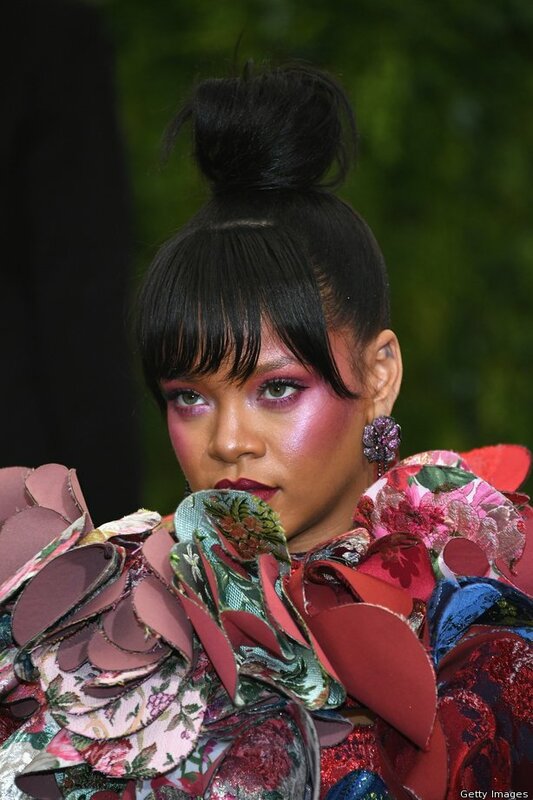 Rihanna, the presumable Queen of the Met Gala since her regal entrance to the carpet in 2015, payed true homage to Rei Kawakubo by wearing Comme des Garcons. Although the actual outfit isn't my favorite from Comme des Garcons, I like that she followed the theme in a direct and literal way and the makeup was BOMB. In the end, it brought the drama and avant-garde-ness that the Met Gala calls for and she respected the honorary designer without making it all about herself, so I applaud her. I have zero reservations about her after party look, though. Pajama street wear, feathers, AND statement sunglasses? Count me all the way in. This 3D Tory Burch gown challenges typical structural norms in true Comme des Garcons fashion, so I say it's a hit. Her after party look was amazing, though. She looks stunning, obviously, but this was off-theme in a way that I couldn't get past. Maybe because it's very flattering and sexualizing in a traditional way, and Comme des Garcons is quite literally the opposite of that? Hailey's look didn't seem to be on theme at all, but I like that she did something different and more daring. I've been waiting to see something different from her and this was it. There are minimal photos of her after party look, but from what I can see, this seems more her--she's in her element, wearing sneakers yet still looking glam. I think the streets are just Kendall and Hailey's real style stomping grounds, not red carpets. I can't come up with any substantially strong argument for this look being on theme. Buuuuut I'm okay with it because I absolutely LOVE the dress and it fits her beautifully. I feel like she's been in the game for long enough that she can show up to the Met Gala wearing something more toned down simply because it's her style. She could've worn that anywhere--she could've worn it to walk her dog, she's Gwyneth Paltrow for Christ's sake--so she wore it to the Met Gala, just another night in her schedule. A$AP Rocky seemed to approve, too, which kind of made me ask myself, "Who am I to say this look is sub-par?" ....but wouldn't a semi-messy topknot look cute with it? I feel like Rocky could agree with that. This seems more Maison Margiela to me than Comme des Garcons, but I'm tolerating it--it's semi on-theme because it's dramatic in a way that turns heads and begs the question, "Why does this look good even though it's slightly strange?" Although Candice did bring the drama, neither of these looks are on theme in either the literal sense or figurative, more imaginative sense. However, I am giving these two soul sisters a free pass because this is their first red carpet appearance since the birth of their (respective) children, and I missed them so much at the Victoria's Secret Fashion Show that I don't particularly care if they put effort into the fast and bumbling fashion scene. They're moms now, so who has time for that? I can draw a semi-connection between this look and the theme because Stella's style is quite edgy with a hint of weird, like Comme des Garcons, so anything she wears seems to carry that aura. It definitely doesn't scream Comme des Garcons, but it would be perfect for a Great Gatsby theme. Can that be a theme, please? "Great Gatsby: The Fashion Revolution of the American 1920s." I'll play Myrtle.